After a busy day at work, Harris Ranch knows that the average consumer does not always have the time or the inclination to search through a cookbook and look for recipes featuring less familiar cuts of beef. He or she may be thinking, “Flank steak is priced well, but what do I do with it?” or “I’m in the mood for a tender roast. Which cut would be best for tonight’s dinner?” That is why the company has created the first of its kind Harris Ranch Online Chef program available from any smartphone. The consumer simply scans the QR code located on the Harris Ranch point-of-sale display at the grocer’s meat case. He or she will then be instantly directed to the company’s site where each recipe is broken down by the cut that is selected. Whether stewing, braising, grilling or roasting, the Online Chef provides quick and easy recipes that will make preparing a meal fast and easy. 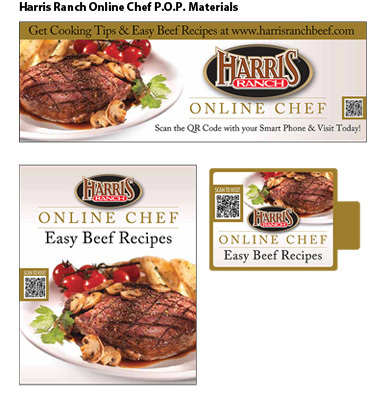 With the help of the Harris Ranch Online Chef, each customer can become the master of his or her own kitchen. The new point-of-purchase (POP) program will be featured on header cards, shelf talker cards and posters and will be free to all consumers. To find out more about Harris Ranch Online Chef program and other promotions, including sampling and special events, make sure to check out Harris Ranch’s Facebook and Twitter pages. Customers who use the program will be rewarded with a special $2 off coupon only available online.